China has become Latin America’s third biggest source of foreign investment as a mining boom unleashes a new wave of infrastructure funding explains David Hill in China Dialogue. Minmetals’ acquisition of Las Bambas – a US$7 billion deal confirmed in July – means Chinese interests now control one third of Peru’s mining sector, according to the president of Peru’s Chamber of Commerce. When Las Bambas starts production next year, it is expected to generate some 400,000 tonnes of copper per annum – half destined for China. However, China’s growing prominence in the region’s trade raises serious concerns. Worries include unequal exchanges – with Mexico in particular – and possible future poverty traps, unless governments balance the minerals boom by developing other industries.China’s current economic strength was achieved by attracting foreign investment into the manufacturing sector, whilst braving rejection by insisting on technology transfer from would-be investors.“Latin America sends raw materials to China and in return buys manufactured goods,” says Dussel Peters. “This isn’t sustainable in the medium- or long-term, and the people who know this best are the Chinese. They’d never accept this kind of trading relationship themselves.”Another simmering issue is that trade ties are unevenly spread across the region. 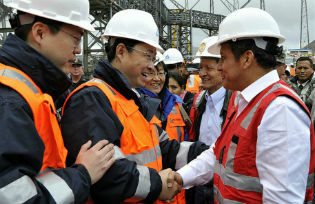 Exports from Mexico, Ecuador, Paraguay and “most central American and Caribbean countries” to China remain comparatively tiny, states Yong Zhang, from the Chinese Academy of Social Sciences, in a recent academic paper.Infrastructure construction is another sector seeing a rise in ambitious, large-scale projects and plans by Chinese interests in Latin America. “This is much more recent than the trade ties and is a second wave in the new economic relationship between Latin America and China,” says Dussel Peters. “Since the economic crisis, China has been exporting capital in such a manner that in the last two or three years it has become the third major source of overseas foreign direct investment.”Chinese banks are now set to take their financing role to yet another level. Last month the BRICS summit agreed to establish a US$100 billion “New Development Bank” headquartered in Shanghai to finance “infrastructure and sustainable development projects” in BRICS and other “developing” countries, as well as a reserve pool of a US$100 billion, called a “Contingent Reserve Arrangement”, to tide countries over in case of balance of payments problems.However, there is considerable concern among certain sectors about the potential impacts of China’s growing presence – on Latin American society, the environment, even national sovereignty. Partly this is because any investment or project is viewed as cause for concern, and partly because of China’s domestic environmental record, labour conditions , and lack of transparency and accountability.Some Chinese companies have already bought into particularly controversial projects. In Peru these include the two most contentious – and two of the biggest-producing – oil concessions where serious contamination has led to “environmental emergencies” being declared in four different river basins, and mines like Marcona, Rio Blanco and Toromocho.Rio Blanco was bought by a consortium led by Zijin Mining despite several years of unrest under the previous owner that saw protests by thousands of people, torture, killings and a UK High Court case. However, others argue that the regulations binding Chinese banks when making loans set higher standards than their Western contemporaries. Although there is mixed evidence it is being complied with since it was adopted two years ago, China’s “Green Credit Directive” (GCD) – a government regulation requiring banks to consider socio-environmental impacts before making loans – is thought by some to exceed Western green finance models.“The GCD sets a very high bar,” says Paulina Garzon, from Ecuador’s Centre for Economic and Social Rights (CDES), although she points out that putting it into practice is another matter.“Two things that Chinese banks and many countries in Latin America have in common are that their environmental regulations are OK, but the implementation and supervision systems are very weak,” she says. “Chinese investments in Ecuador are massive, and so far they promise to be environmentally tragic for the country.”The impact of Chinese operations in Ecuador has arguably generated more concern than anywhere else. In addition to mining and exploiting oil in the Amazon, Chinese companies are now involved in a series of hydroelectric dam projects, and proposals to build an oil refinery on the Pacific Coast. Chinese banks have lent so much money that some argue the national debt is out of control and Ecuador’s sovereignty is under threat.Ecuadorian civil society is fighting back, adopting strategies such as lobbying Chinese banks, taking legal action, publishing a manual on socio-environmental regulations for Chinese loans and investment abroad, and appealing to international institutions like the Inter-American Commission on Human Rights.